Located on 6 country acres in the beautiful upstate of South Carolina. We create beautiful and functional Bowls and Birdhouses that feature hand-carved intricate designs, each one unique! Angela, a self-taught Artist, has been drawing and painting since childhood. 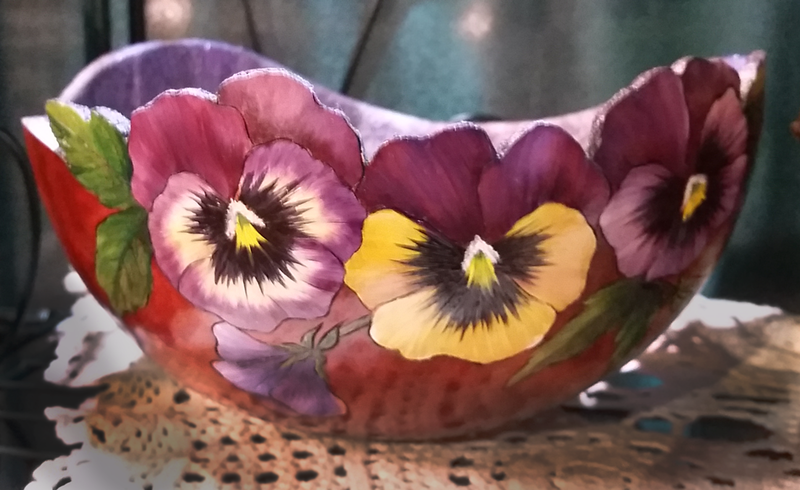 After experimenting with several mediums, the discovery of gourds and their wonderful versatility and character led to a whole new creative outlet. John, a former Electronics Technician, uses his skills to hand-carve intricate designs on gourds with such precision, many assume they are done by machine. Together, he and Angela collaborate to create beautiful and functional gourd bowls and designs. No two are ever alike! They are as varied as people. Big, small, tall, short, thin, fat, smooth, rough, each one with its own character. When we select a gourd to work with we hold it, turn it, study it, study it and allow it to speak to the artist in us. Please view our showcase of gourd art. Bird houses, bowls, Christmas decorations, Fairy gardens and more. Each item hand crafted and unique. We’d love to hear from you…..
Keep up to date with information about The Backyard Barn by joining our mailing list. Simply fill out the form below and we’ll keep you informed about our upcoming shows and events, special offers, and news. We value and respect your privacy. We do not sell or share your information with anyone else. Your email address will not be shared with a third party, nor will it be sold or used for purposes other than subscription for our newsletter.